THE SHAMISEN is a traditional Japanese instrument about one metre long, with three strings, and played using a large pick called a bachi - and Galway is about to see a show from two of its finest players. The renowned Japanese Tsugaru shamisen players, the Yoshida brothers, play the Nuns Island Theatre, tomorrow [Friday March 23] at 7.30pm. The concert is presented by The Embassy of Japan in Ireland. 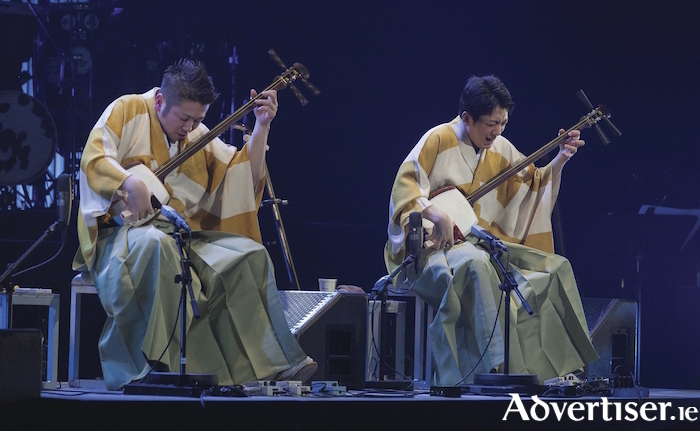 The Yoshidas were born in Noboribetsu, Hokkaido, and started learning to play the shamisen at the age of five. In 1990 they began studying tsugaru shamisen under Takashi Sasaki I. The tsugaru shamisen was developed in Tsugaru, Aomori Prefecture, in northern Honshu, the main island of Japan. It has a unique style of play which gives performers room to improvise. The Yoshidas made their major debut in 1999, while their debut album sold more than 100,000 copies, an extraordinary figure for a traditional folk music release. They have won the Traditional Japanese Music Album of The Year category and the 30th Anniversary of Normalization of Japan-China Diplomatic Relations Commemorative Special Prize at the Japan Gold Disc Awards. Admission is free but booking is required as space is limited. For more information contact the Galway Arts Centre (091 - 565 886, www.galwayartscentre.ie ).